The IAEE Art of the Show Competition’s Show Promotion Website category evaluates any web site used to promote attendance at a show. Judging criteria includes: overall presentation, visual appeal and creativity; organization of the information presented and ease of navigation/user-friendliness; clarity of pertinent information, value of information presented and content usefulness; performance metrics such as average monthly visits, Google analytics, etc. ; and how the website contributed to the overall success of the exhibition and/or event. The signature conference and exhibition of the Ontario Hospital Association (OHA) for over 90 years, HealthAchieve is an award-winning event that has long been one of the largest and most respected health care events in North America – the preeminent gathering place for health care and business leaders. HealthAchieve continues to inspire ideas and innovation by providing global health care and business leaders with an unparalleled opportunity to learn from each other, share their ideas and evolve their perspectives. The goal of the show website was to provide an easy navigation experience for its distinct audiences: prospective attendees and potential exhibitors. The prospective attendees are made up of international health care and business leaders. The potential exhibitors are made up of medical suppliers and commercial vendors from across the globe. HealthAchieve provides the platform for unlimited networking opportunities between the two distinct audiences, and would not be the distinguished event that it is without ample participation from both. The objective was to build the website to be responsive in design and to include a noticeable global navigation for both attendees and exhibitors. Whether an attendee was a health care professional or a commercial vendor, their experience with the website was seamless and compelling. 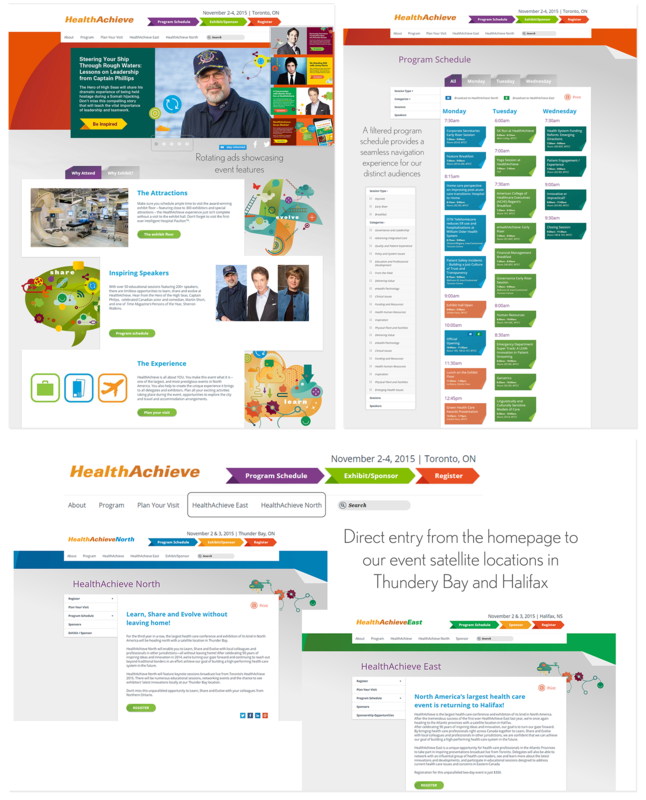 The website offered the opportunity for HealthAchieve to showcase event features on the homepage through rotating ads, and provide visitors with direct entry to its event satellite locations in Thundery Bay and Halifax. To help guide its diverse audience, the program schedule could be filtered down by session type, topic category and by speakers. The registration call to action was one of the main focal points on the homepage, and was repeated on various pages throughout the site. 11,890 to the Exhibit/Sponsor page. These numbers supported OHA’s goal of providing an easy navigation experience for HealthAchieve’s distinct audiences. The Hearth, Patio & Barbecue Expo is North America’s largest indoor-outdoor living showcase. Every year, over 350 leading hearth, patio and barbecue manufacturers and suppliers exhibit and demonstrate their latest home heating solutions; grills, grilling accessories and fully-equipped outdoor kitchens; casual patio furniture and outdoor accents; water and landscape features; all-weather entertainment products and more. It’s also a one-stop-shop for retailers nationwide to find not only the latest products for their showrooms, but also the latest services and technologies for their companies. 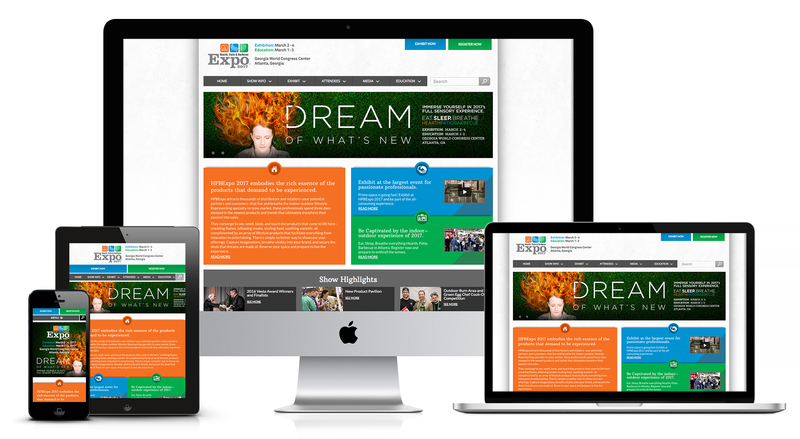 One main goal for the new HPBExpo website was to improve the user’s mobile experience. Frank Strategic Marketing and HPBExpo planned and designed the site from a mobile user’s perspective first, then built out the desktop experience. This required streamlining the content and overall design of the site to take into account best practice responsive web development techniques. The next goal was to improve the organization and presentation of the in-depth and robust education schedule. Previous versions of the schedule consisted of static charts/tables. The site implemented a tool that allowed users to sort the schedule by date, session name, time, credits, and event type. The print and virtual sponsorship brochure was converted into a webpage allowing easy and real time access to open sponsorship opportunities. As sponsorship opportunities sold out, the page could updated in real time to reflect the latest information. The Education Schedule section of the website also received a complete overhaul. Previous versions of the schedule consisted of static charts/tables. Once again, the site implemented a functionality that allowed users to sort the schedule by date, session name, time, credits, and event type allowing users to custom view content according to their preference. SuperZoo is the largest pet industry trade show in North America, with a more than 60-year history of helping pet retailers and service professionals discover new products, find amazing deals, learn how to build their businesses and connect with others who share their passion for pets. SuperZoo started out as a modest, regional trade show but has grown tremendously over the past decade, since moving to Las Vegas in 2004. SuperZoo 2016 marked the biggest SuperZoo in history, with the most exhibitors, buyers and education hours of any pet industry event in North America. SuperZoo has long been known as the event for the independent pet retailer, but it is also well-attended by pet service professionals and groomers, international buyers and corporate buyers interested in expanding their presence in the consumer pet market. SuperZoo exhibitors include distributors and manufacturers of products for cats, dogs, reptiles, aquatic animals, birds and more, as well as companies offering retail-specific services. mdg revamped the SuperZoo website in 2016. This re-envisioned website was designed to drive registrations and exhibitor participation by improving the user journey and event positioning with a clean, modern layout and mobile-friendly design. We sought to increase visual interest in line with current user expectations and also added content to help exhibitors promote their presence onsite through media relations. The website incorporated the 2016 “STAND OUT” campaign concept and featured an innovative homepage that drew attention to the different content available on the site with interactive boxes that change color when you scroll over them. Special vignettes in the right-hand corner of each page complemented the content on that specific page, continuing to delight and engage users as they delved deeper. The website also took advantage of unique pieces of content that were available, including a show overview video and a widget from InGo that featured registrants’ Facebook profile pictures to provide a sneak peek at who was attending. These pieces were prominently placed within the infrastructure of the homepage and each interior page. A new exhibitor media toolkit page provided press release best practices and guidance on the pressroom. Exhibitor press releases were also showcased in a visual format on the press page, leveraging the product images included in many of the releases to draw attention and drive clicks. Reflecting the significant changes to the website design and layout in 2016, metrics increased significantly across the board. The number of sessions increased more than 11 percent to 181,014, page views rose more than 19 percent to 416,477 and users increased more than 9 percent to 105,820. At the same time, and indicating the quality of content, engagement metrics also rose significantly. Pages per session increased more than 8 percent, the bounce rate dropped 10 percent, and session duration increased more than 8 percent. Finally, mobile traffic rose more than 19 percent, suggesting that the clean, mobile-friendly formatting made an impact. The additional exhibitor content and reformatted online pressroom were also successful, contributing to a more than 44 percent increase in exhibitor submissions to the digital pressroom over 2015. The 2017 IAEE Art of the Show Competition is now underway – you have until 31 August 2017 to submit your entries! You can also view all of last year’s winners and honorable mentions here.